Thea: "Is nobody else gonna say it? It's Cupid, stupid." I guess the lesson of the episode is, don't date co-workers. There were a lot of things to like about this episode. Despite being amazingly frustrating, there was this air of dread hanging over the episode for me, because I knew Oliver and Felicity were not going to get back together. I didn't know for certain, but it felt disingenuous for them to reconcile so quickly. Also, the sentiment of the episode seemed to clear up the whys and focused the split on the 'real' issues buried deep in the relationship. Apparently the cold, detached, alone for all time Oliver was right. Or at least that's where Felicity is right now. Because she has come to the exact same conclusion that Oliver did, only five months later and at the worst possible time. It doesn't even make sense, when she has already committed to this life and understands fully the nature of being a hero. Sacrifice and occasionally deception are a part of the job description. So she quit. Because that has worked out so well in the past. And after taking a deep breath and getting over my frustration, here are a couple of things I actually liked about this episode. For one, the trial of Damien Darhk. I had hoped there was more of a case against him, but in the end it came down to our heroes trying to testify without incriminating themselves. Which made what Quentin did all the more heroic, sacrificing his reputation, career, potentially his freedom and his life to bring Damien Darhk to justice. It was such a powerful thing to do. Quentin has had his ups and downs throughout the series, going from antagonist to ally and back at least twice. But none of that really matters now, because ultimately he did what he had to do for the good of the city. It kind of reminds me of what Moira did back in season 1, coming out as part of Malcolm's plan to destroy the Glades in an attempt to save lives. 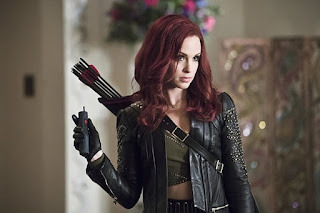 I also liked Amy Gumenick's return as Cupid. She is totally convinced that her Arrow is dead and gone, and of course Floyd Lawton is dead as well. So she's turned homicidal, proving that Waller's structure for her Suicide Squad was woefully broken (releasing Cutter resulted in at least two dead couples, and it was implied more were killed as well). Yet I loved how Felicity got through to Cutter, and I wonder if we'll see her again next season, since she was captured alive. There was quite a bit of fun on the Island, as we learned what Reiter's plan involved. Apparently he was after an idol that uses souls as a form of magical battery to give the holder of the idol power. That's both crazy and kind of sane at the same time (if you consider magic sane). We also learned a little about Reiter's history, and why he is doing what he is doing. I actually connected to him as a character for the first time; despite his truly evil personality, his motivations at least make sense. We also got a bit of Die Hard: Cave Edition with Oliver and Taiana running around and taking out Reiter's guys; now they have guns... ho ho ho. Oliver's vows were awesome, and Felicity's dress was gorgeous. Stephen Amell probably deserves the acting trophy of the week for making me sympathize with Oliver over Felicity. The arrow in the credits was a cupid's arrow again, just the last time she had a solo episode. Cupid's whole "love is dead" thing was a bit on the nose, as usual. Oliver is chasing Cupid and can't catch her. Nothing symbolic about that at all. Darhk's lawyer Fitzmartin is a Lazarus pit of slime. Okay, small nitpick about Cupid driving off with a couple just as they got married. While it was fun imagery chasing down the limo, complete with pink and purple flowers, and cans dragging behind, I doubt that would've been a tough APB for the cops to track down. Unless the police of Star City are deeply stupid. Taiana's trying to smash the idol was pretty funny. Felicity Scissorhands (presented without comment). Quentin is suspended from the force. Can't say I'm surprised and neither was he. Did Darhk just break the fourth wall? So cool! Cupid: "Love is a bullet to the brain. Or an arrow to the heart." Lance: (to Oliver) "Hey, you okay? You're looking a little more grim than usual." Felicity: "Looks like she's kidnapped another celebrity couple: Allison Lee and Robert Joyce." Reiter: "The difference between insanity and belief lies in the number of believers." 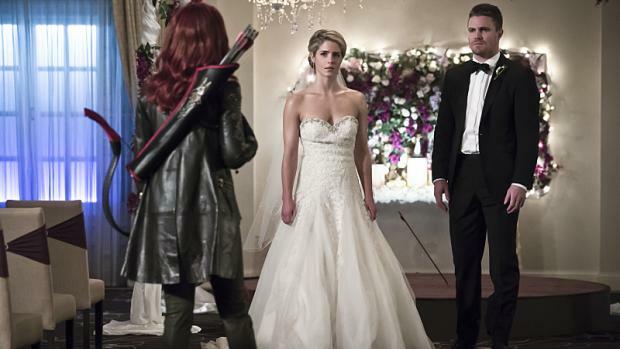 Oliver: "That's not exactly how I pictured our wedding day." Felicity: "I don't know. Being kidnapped by psychotic criminals has sort of been the theme of our relationship." I don't think I have the distance to judge the series right now. Perhaps retroactively at the end of the season.
? out of 4 Cupid arrows to the heart. Yes, I echo your frustration, J.D. Isn't it time for them to stop the artificially induced drama to break Olicity up? Couldn't they just be a couple for awhile? I really enjoyed Mama Winchester in this one. And Quentin Lance. Everyone knows prison guards check prisoners mouths so how did Darkh hide a ring in his mouth. Worst prison guards ever.